Sequential Circuits Prophet-5 synthesizer ad from page 39 of Contemporary Keyboard Magazine May 1981. This ad was part of a series of 'Ear-Force' ads that Sequential Circuits Inc. was running throughout 1981. 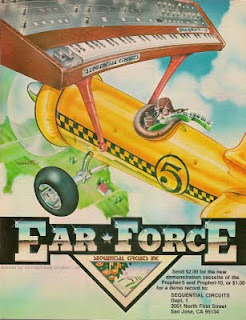 The Ear-Force series included full-page ads for the Prophet-5, Prophet-10 (view it here), and Pro-One (coming soon!) . The fabulous artwork for each ad revolved around the theme of the air-force and a pilot flying a plane, and all three were later made into a series of posters that were promoted in Keyboard Magazine during the 1982 Christmas season along with other mouth-watering merchandise including this SCI belt buckle. These three ads were not the only ones that the artist, Mattos, created for SCI. The business relationship goes back as far as 1979 when he created the artwork for a two-page Prophet-5 advert 'Beware the False Prophet'. More on that ad, and hopefully Mattos, in the near future. There is a lot of reference material available online for the Prophet-5, including these top three Google results: Vintage Synth Explorer, Synth Museum, and Wikipedia. Also check out the Prophet5.org discussion board for information on some old and new Prophet gear. Sound Sales Inc. 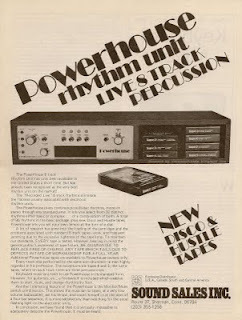 Powerhouse 8 Track Rhythm Unit ad from page 13 of Contemporary Keyboard Magazine June 1977. 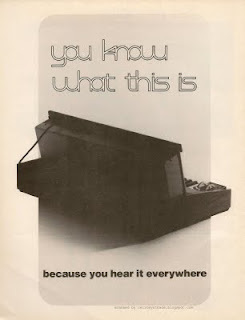 I first became intrigued by this ad because I had not heard of what is essentially an 8-track drum machine. For those of you too young to know what an 8-track is, I recommend you read this Wikipedia page. As I did more research, I became even more intrigued with the parent company, Sound Sales Inc., and got caught up in the rather sad story involving what has been described as 'the accidental loss' of the well-known Mellotron name by the original manufacturer, Mellotronics. As I looked through later issues of CK for more research material, I noticed that Sound Sales Inc. seemed to suddenly stop advertising the Powerhouse in early 1978, only to pop up again around May 1978 with a 1/3 page ad that exclaimed 'Mellotron - now made in the USA! A division of Sound Sales Inc'. Turns out that Sound Sales Inc. was a company that serviced Mellotrons in the US, and they essentially ended up with the Mellotron inventory and the rights to the Mellotron name after the complicated collapse of the original makers of the Mellotron and the resulting 'liquidation blunder'. You can check out the full history of the Mellotron at Mellotron.com. Although the ad does a fair bit to explain how the Powerhouse functions, there is unfortunately not much information available online. If anyone knows more about the Powerhouse, don't be a stranger - please comment! 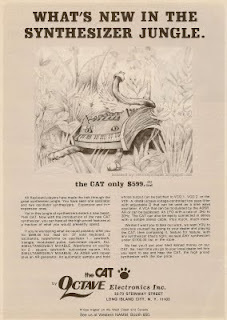 Octave Electronics CAT synthesizer ad from page 7 in Contemporary Keyboard magazine February 1977. 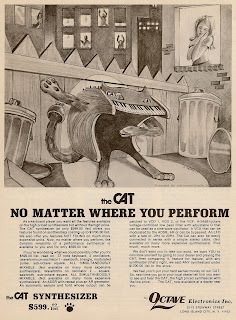 This was apparently the first CAT ad created by Octave Electronics after the synthesizer was announced in the Spec Sheet section of Contemporary Keyboard in December 1976. Most other synthesizer ads at the time drifted somewhere between text-heavy technical ads like this Moog ad and photo-heavy ads like this ARP ad. To introduce the world to the Cat, Octave Electronics kept the text-heavy technical aspect, but replaced the standard photo-op of the synthesizer with a cartoon image that took the reader out of the studio and, in this case, into the jungle. Octave continued to use this cartoon theme in a small string of ads (to be seen in future blog posts). Its not to say Octave Electronics were the only company to enlist artists. Around the same time, ARP was promoting their sequencer with an artist drawn (and I think creepy looking) hand image, and three or four years later, Sequential Circuits became well-known for their use of cartoon images in the Ear-Force ads and the continued use of the wizard-like image in a variety of ads for different synthesizers. You can find lots of basic information online about the CAT , including Vintage Synth Explorer and Synthmuseum.com but Music Machines' spec sheet on the CAT written by Mike Dvorkin is by far one of the best resources I've found. Alas, there doesn't seem to be an Octave Electronics or CAT synthesizer page on Wikipedia. But, if you are going to check out just one link from this blog post, check out Gordon Reid's interwoven history of the Octave Electronics CAT and the ARP Odyssey published in May 1999 for Sound on Sound magazine. 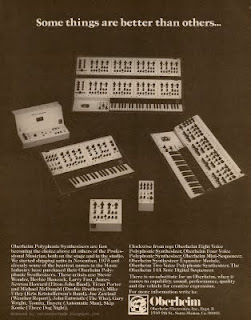 Oberheim advertisement of its family of products including Oberheim Eight Voice, Four Voice, Two Voice and Expander Module synthesizers, and Mini-Sequencer and 144 Note Digital Sequencer from page 9 of Contemporary Keyboard magazine August 1976. Oh, hello. Did I just walk in on an Oberheim family photo shoot? I think I'm dreaming. This Oberheim advertisement is fabulous for a number of reasons. It contains photos of numerous Oberheim gear from 1976. It has historical value because it tells us when Oberheim started shipping gear - November 1975. Did I mention all the gear? Oberheim did another family photo a decade later - I still like to flip back and forth between the two ads to see just how far things have come in ten years. And I think it even beats Roland's family photo ad from 1978. ARP Axxe synthesizer ad from inside back cover of Contemporary Keyboard magazine October 1976. 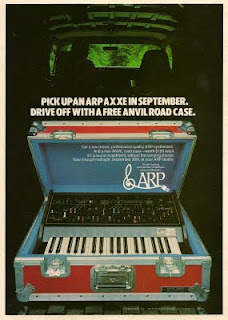 Keeping with my promise to play catch-up with ARP ads, here is another ad that featured a free ANVIL road case, this time with every ARP Axxe purchase. The one thing I like about this ad is that it is in colour, something not that common for ARP ads in the very early years of Contemporary Keyboard. And I wouldn't be surprised if ARP decided to run this ad in colour just to showcase those multi-coloured slider caps in all their rainbow glory. The slider caps, found on many early ARP synthesizers (and often lost during or shortly after your first gig), provided a splash of warmth and humour within an industry that at the time was still gravitating towards very scientific styles and designs. Online references of the ARP Axxe could use some updating from Axxe enthusiasts - but the basics can be found on the usual sites. Explore Google for more. 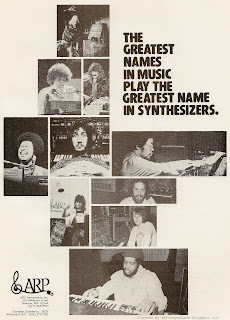 ARP musician endorsement ad from inside back cover of Contemporary Keyboard magazine February 1977. As mentioned in my last post, I'm kind of playing ARP catch-up. Also, as I mentioned in my last post, ARP was (in)famous for name-dropping. And, while doing research for an ARP 2600 ad to be posted in the near future, I found out why. It seems Alan R. Pearlman gave at least a few well-known musicians ARP gear in exchange for their professional endorsement. I'm sure they weren't the only company to do it, but ARP sure did get some good mileage out of the deal. Take this fabulous ad, for example. I'm not going to pretend I know all the musicians, but one does stand out for me - The Who's Pete Townshend. And, according to thewho.net, the photo of him featured in the ad above was used as far back as 1972, including this ARP ad from Rolling Stone magazine. Another great 1975 ARP ad is also featured on this site.